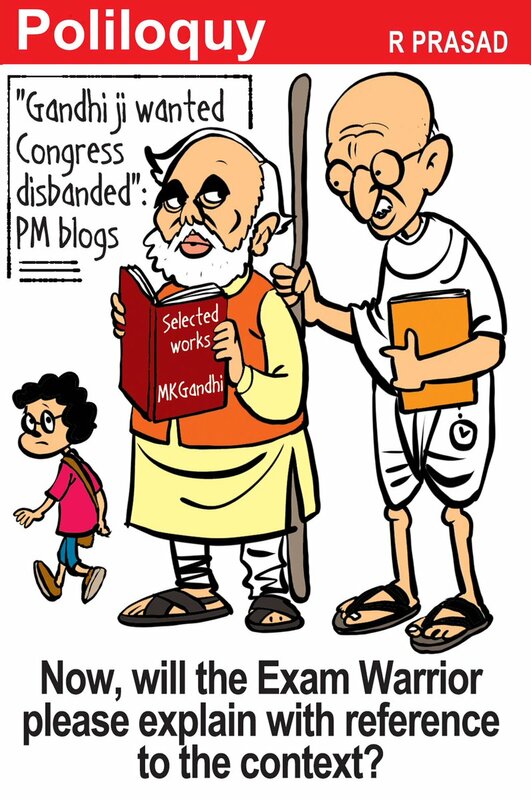 Taking a potshot at Prime Minister Narendra Modi’s recent comment about Mahatma Gandhi, R. Prasad suggests to the PM to ensure that he retains the context when making comments. 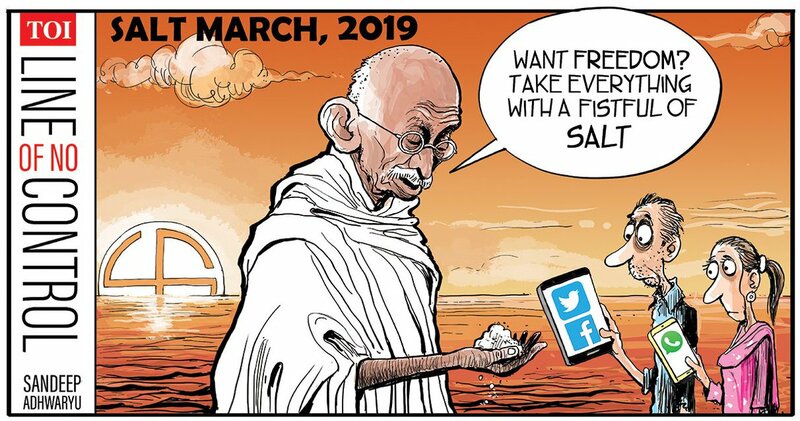 On 12 March 1930, Mahatma Gandhi led the historic Dandi March inspiring millions to walk the path of civil disobedience to revolt against the British Government. 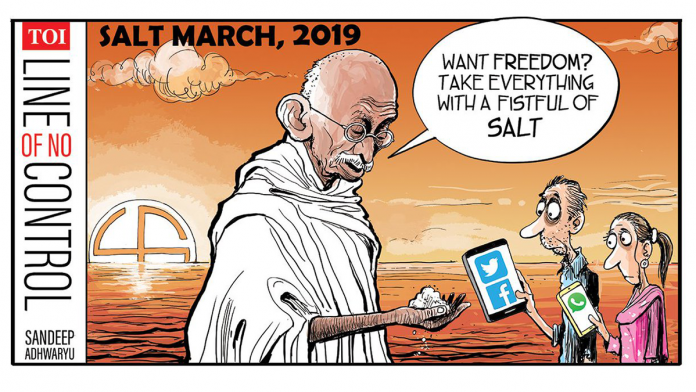 Sandeep Adhwaryu Tuesday remembered the Mahatma on the 89th anniversary of the Salt March, adding a ‘fistful of salt’ to his punch-line. 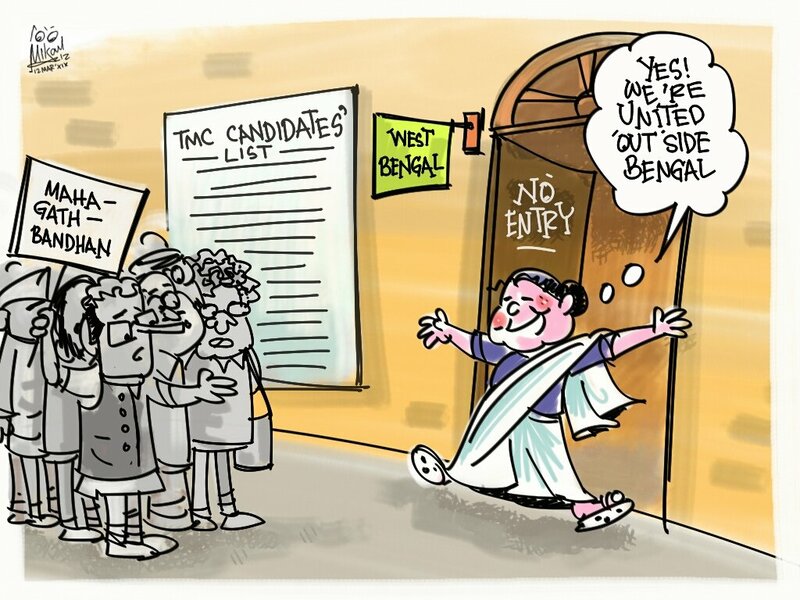 With West Bengal chief minister Mamata Banerjee announcing the TMC candidate list for all 42 seats in the state, Mika Aziz takes a jibe at Banerjee for seeking the ‘Mahagathbandhan’ only outside her state. 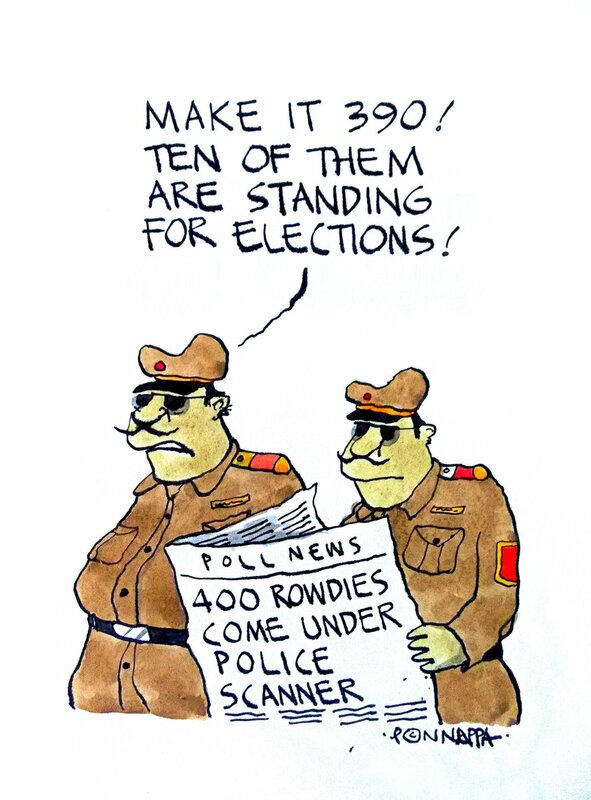 Nala Ponnappa takes a dig at politicians with criminal records as the Lok Sabha polls edge closer. 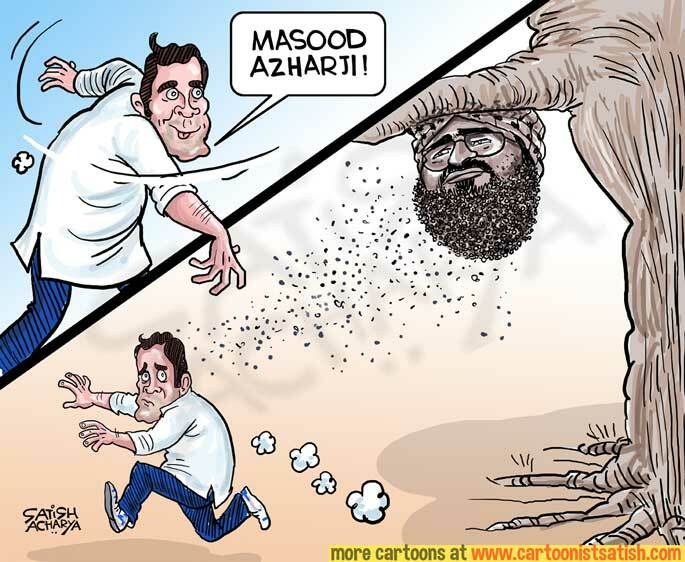 Satish Acharya illustrates Congress President Rahul Gandhi’s comments on Masood Azhar backfiring after he addressed the JeM chief as ‘Masood Azharji‘. 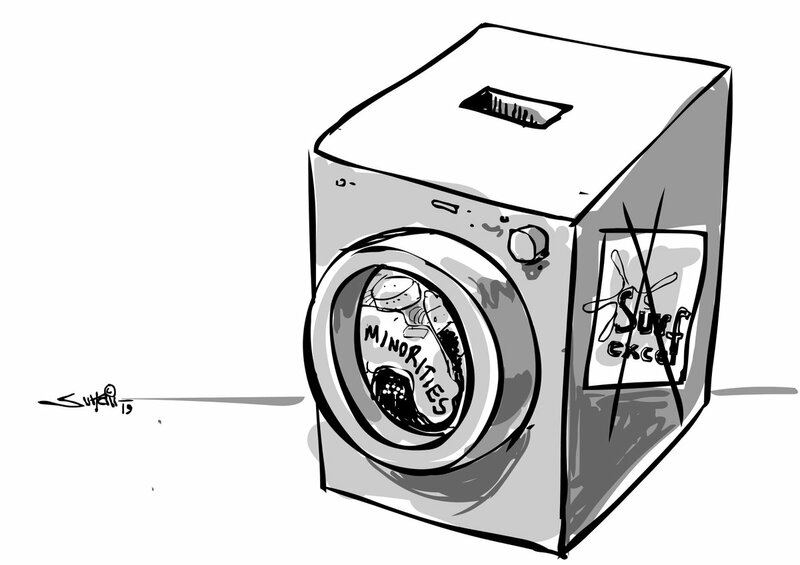 Suhail Naqshbandi on the communal divide in India after a recent Surf Excel commercial faced severe backlash for promoting communal harmony on the occasion of Holi. Sajith Kumar for the Deccan Herald takes a potshot at the Modi government for politicising the Balakot air strike. 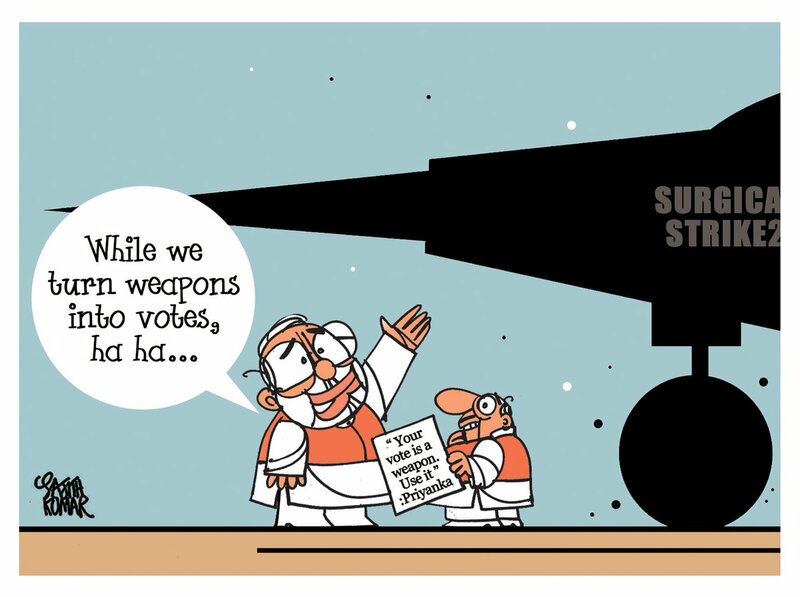 The cartoonist plays with Priyanka Gandhi Vadra’s comment in an election rally in Gujarat where she said that a voter’s vote is a weapon.